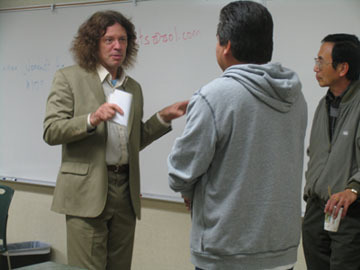 Mark Fitchett presented "Music Instruction and the Special Needs Child," a discussion of his school's experiences with their special needs students, to parents of the Greater Long Beach / San Gabriel Valley Chapter, Autism Society of America in his lecture at Emerson Parkside Academy Charter School in Long Beach, California. In the last 10 years Mark and his instructors have had many opportunities to work with autistic and special needs children even though his organization is not specifically a special needs school. Mark's music schools are run with the philosophy that all students are not alike and should be educated in the way that is most helpful to the student; that group or classroom instruction is not as individualized as most students need in order for them to achieve the greatest success, and finally, that all instruction should be on a one-on-one basis so as to fully focus on students' specific needs and interests. This customized approach to teaching fits the special needs students since no one program or approach will benefit all students, special needs or not. One-on-one music lessons in a regular music school environment are an opportunity for these students to participate in a mainstream activity without the distraction of other students.